Muisne is famous for having probably the most beautiful beach in Ecuador and for being the only island shire capital outside the Galapagos Islands. It is also famous for having the most corrupt local municipal government in the country, election after election. It has amongst the highest levels of unemployment, drug abuse and teenage pregnancy in the country as well. Nevertheless, it is an area that abounds with recreational opportunities: excellent beaches and waterways, mangrove estuaries and forests, open spaces and flat land for sporting fields and a climate that is ideal for being outdoors all-year-round. Clearly, the solution to much of the social problem of Muisne is within reach. 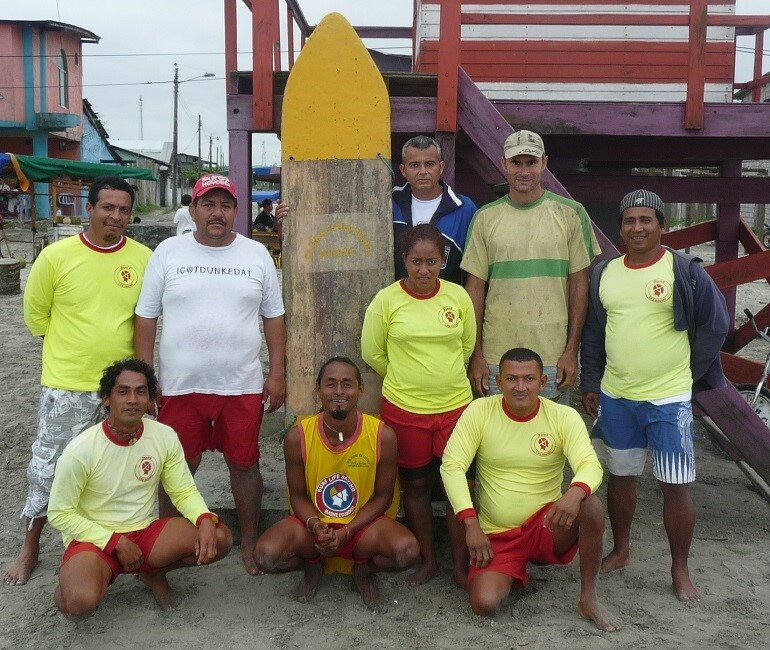 In December 2007 Integridad, then using the name Gondwana Cultural Exchange, commenced a Surf Lifesaving training programme for a group of 14 participants. When we started training, so novel was the sport that many people in the streets called the activity “by wuch” (Bay Watch). One of the dignitaries at the graduation ceremony, the then Minister of Tourism, María Isabel Salvador, agreed to be the symbolic “Matron” of the club as it launched its professional career. The group patrolled the beaches of Muisne and Mompiche for five years saving hundreds of lives and a “zero drownings” record on patrolled days over that time while similar beaches observed often two or three drownings on long weekends. However, wages became increasingly behind schedule. Eventually the club had to suspend its work and has been in a lawsuit with the municipal government ever since. Beach Patrol at Muisne, showing the original home-made balsa rescue board Sept 2011. The board was destroyed in the 2016 earthquake. Integridad has now gone through the red tape to grant the Muisne Surf Lifesaving Club their legal identity and they are optimistic of getting a fair contract with the next mayor. Furthermore, we will train them as a commission to implement an academy and sporting club, serving the youth in the Muisne shire. This is a social, sporting and educational service for the community. Not only is there hope to an end to their desperate financial situation, but they will be agents in improving the quality of life in their own needy community. Once the team is trained, the programme will have weekly activities, mainly sports competition in Surf Lifesaving and related sports, training and education. It will function as a Club Recréate (see “Awaiting Projects” on this web site). Youngsters will be exposed to a different kind of “House Rules”, ones that are bilateral. That means they will learn to respect by being treated with respect, not manipulation. They will learn how to form their own integrity. Their “3 Rs” will be Respect, Reality and Responsibility. As the youngsters begin to see the world as a beautiful place that has blessed them, activities will be introduced into the programme that allow them to share that love with their community. In addition to the fun of sports and games they will practice the joy of serving. There will be working bees for beach revegetation and cleanups, community beautification, tourism communication signs and shelters, services for the elderly etc. At around the same time as Muisne, three other groups of Lifesavers in other parts of the country began forming with only the help of first aid training from the Red Cross. 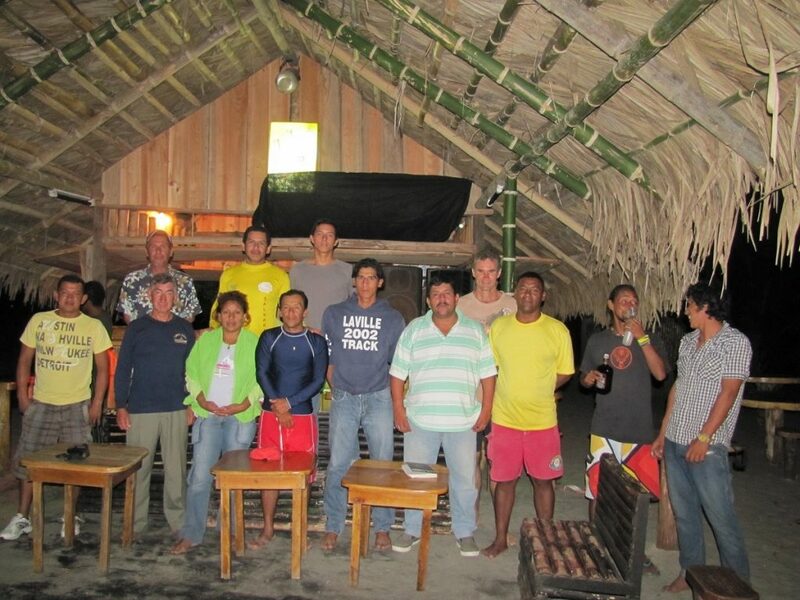 It was emphasized within the training of the Muisne group the need to connect with other groups that might exist along the coast to foster their growth, strengthen each other and establish standard practices and push for laws and rights for the best and synergized management of the service and sport. With Integridad’s consultancy, the Muisne club has been committed to this task. This organization will have an enormously positive impact on the culture and quality of life for coastal town. We hope to continue fostering the process and providing training, equipment and organizational and communication skills to improve the quality and speed of this development.